With a skipper who has 20 plus years of experience, top end equipment, and modern vessel, Hooked Up Charters will have you sorted for your next fishing trip. With Laurie Powell at the helm, the Auckland-based business operates out of Half Moon Bay and has a variety of packages on offer. Choose from fishing charter packages that range from a full-day trip or overnight trips to a smaller six-hour trip catered for individual anglers, or meet other fishing enthusiasts on the Shared Charter package. A day on the charter usually starts between 7am and 8am with return between 3pm and 4pm. Timings vary during daylight savings. Hooked Up Charters also have sightseeing/discovery packages available, and these guided tours can be customised to the client’s needs. Packages include Tiritiri Mantangi Island Discover, Rangitoto – Mototapu Island Escape, Waiheke Wine Trail, Coromondel Getaway, and Island Hop. 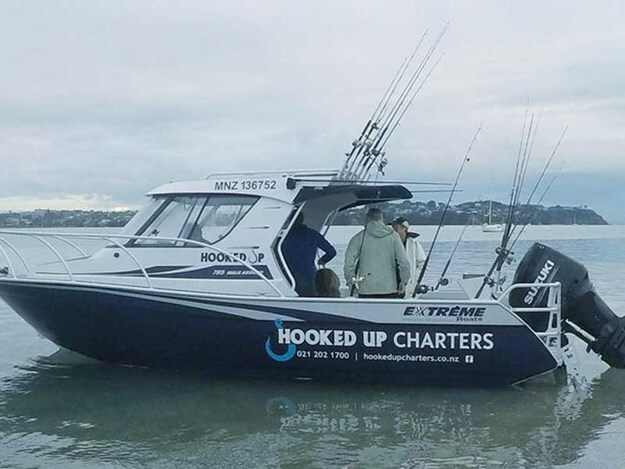 For more information, visit hookedupcharters.co.nz.